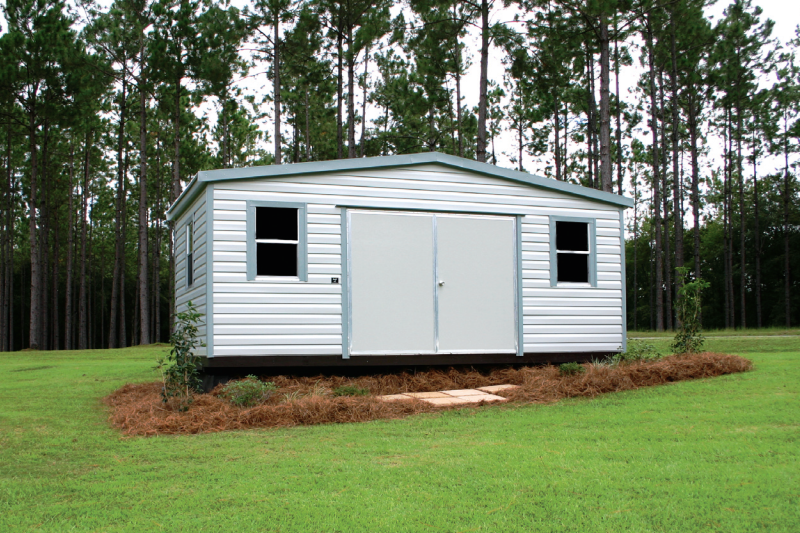 In the world of portable buildings, the Lark Lapsider has an unrivaled legacy of product value and lasting quality. The solid construction and unquestionable durability of this unit has made it a natural to be called the best. To be the best you can never be satisfied with your product. You must constantly strive to improve and refine the materials as well as the manufacturing processes used. We at Lark, in keeping with the spirit of constantly improving our product, are using a construction method known as modular. What this means is that each wall and roof section is a totally independent part of the overall building system and alone it can maintain its structural integrity without the support of other building members. The wall sections are rectangular modules that have 2 x 4 top and bottom plates connected diagonally by rigid steel T-wall or hat channel bracing. This type of support insures that the wall system has consistent support on all wall sections. The reason we fortify our walls in this manner is to avoid lateral movement or distortions of the siding that can result from high wind loading. The roof module is a vaulted section with continuous hat channel connected to each roof rafter at 24″ providing vertical as well as horizontal shear protection. The Lapsider End Gable is also available in our Accu-Steel frame which gives you the same pleasing appearance and unrivalled durability as our wood model. As you can tell from our description, our Lapsider is built to last and stand the test of time. We know our Lapsider will deliver the product value and true satisfaction you expect from a Lark Building. Our vaulted wall system is the construction technique that we utilize on our Side-Gable Lapsider. Traditionally most portable buildings are built with the gable on the short dimension or end of the unit, but the Side-Gable Lapsider takes a different approach. 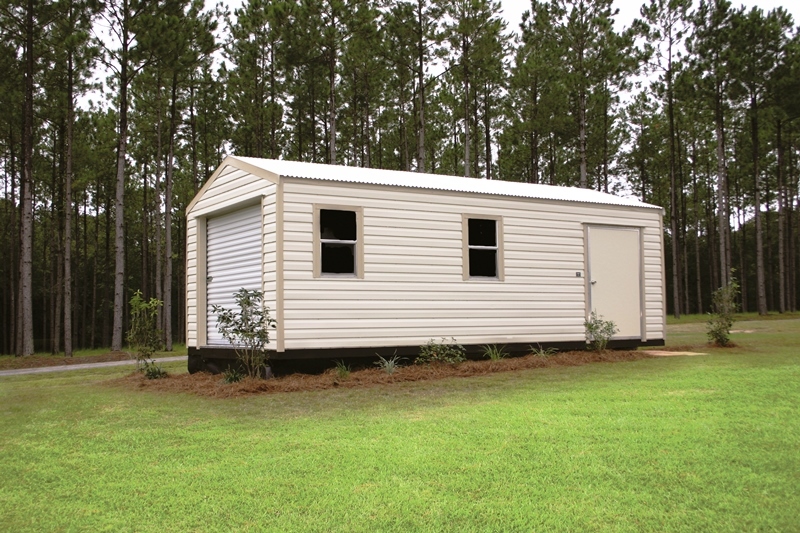 By building the unit with the gable on the long side, we are able to create a building that is not only esthetically pleasing, but also provides higher interior eave clearance and more overall height. All of our vaulted wood walls are constructed using double hurricane clips at all stud connections, on the top and bottom plate for maximum wind up lift protection. For shear wall strength, we run rigid T-wall bracing on the front and back of all walls to protect against lateral or sudden movement, which can result from heavy wind loads. 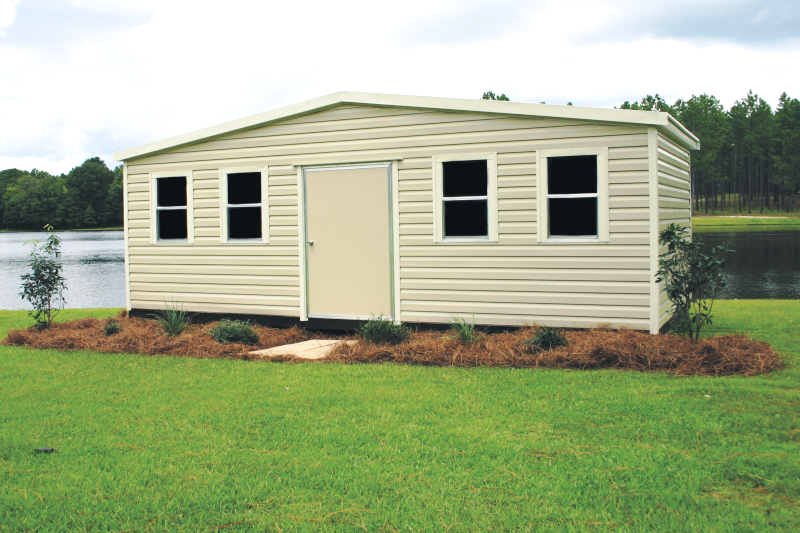 This vaulted wall system combined with our monolithic roof structure constructed with #1 2 x 6′s will deliver for you. 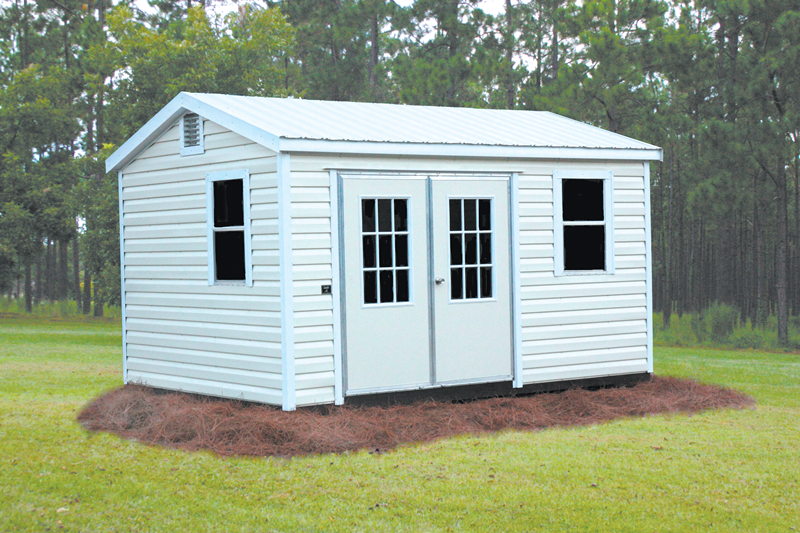 It will provide the strength, good looks, and durability that you expect when you purchase a Lark Building. The Side-Gable Lapsider is also available with our outstanding Accu-Steel frame giving you the same look and pleasing appearance as our wood Lapsider. When you closely examine this building system, we are sure you will conclude that you too, deserve the best. WOOD AND STEEL FRAME The first thing to grab your attention about an End-Gable Box Eave is its clean attractive appearance and the perception that it was built on site to be permanent. At Lark, we have always been sensitive to the aesthetics of our buildings and the End-Gable makes us proud. This is the type of unit that would be welcome in virtually any environment from a nice residential neighborhood to an upscale industrial park. Structurally, the End-Gable Box Eave is built the same as the End-Gable Lapsider. The only real difference is the attractive addition of a boxed overhang. Don’t be fooled into thinking this overhang is just trim parts, it is not. 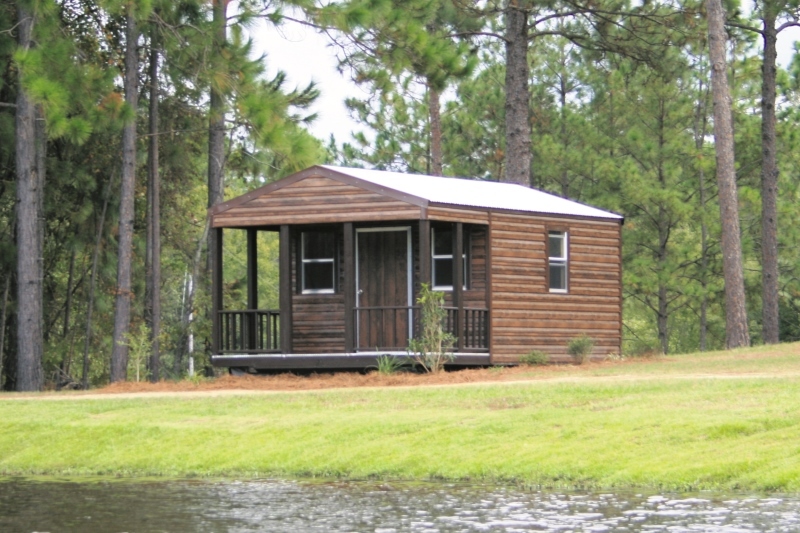 On all of our boxed eave models, the eave of the building is an extension of our main framing system and is just as strong and durable as any part of the overall structure. You can rest assured that regardless of the model Lark Building you choose, you can count on quality and product value matched by none. WOOD AND STEEL FRAME This fantastic A-frame structure is about as versatile as it gets. 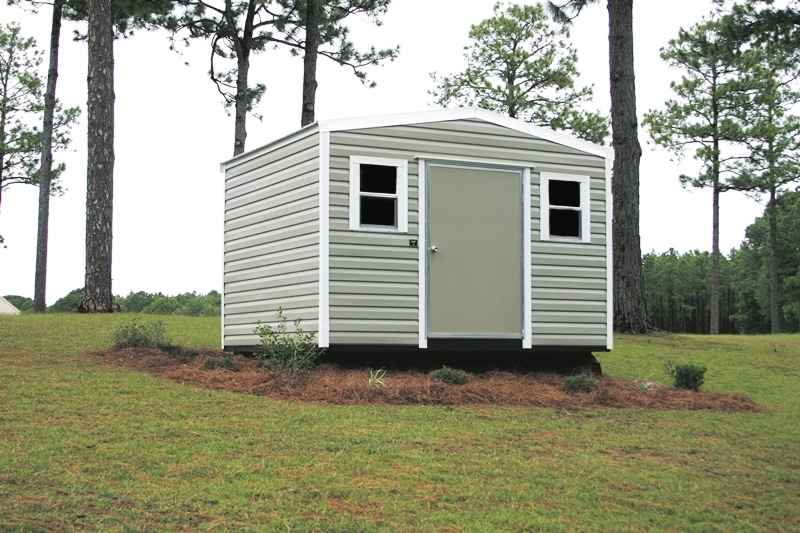 Built with massive vaulted walls, the Side-Gable is designed and engineered for extra overhead clearance and wide open space, not to mention durability and product value. 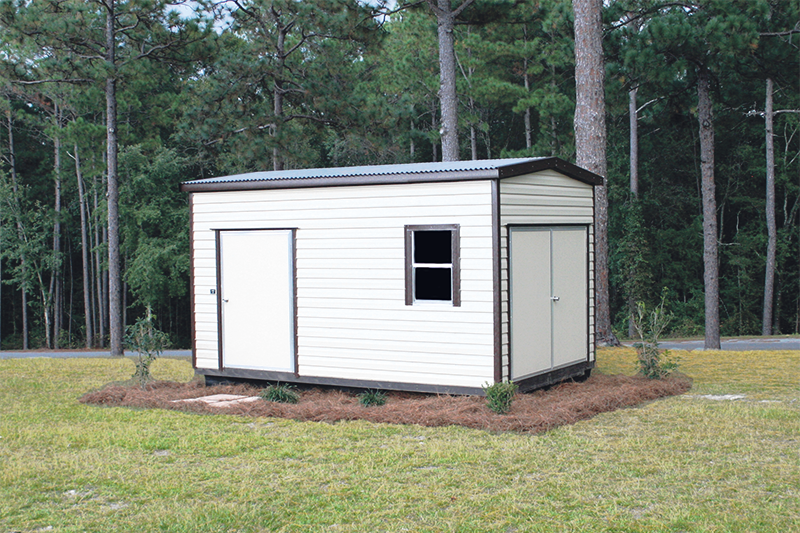 This unit utilizes the same frame and roof system as our Side-Gable Lapsider along with the added feature of a sophisticated Box Eave that enhances the appearance and aesthetics of your building. 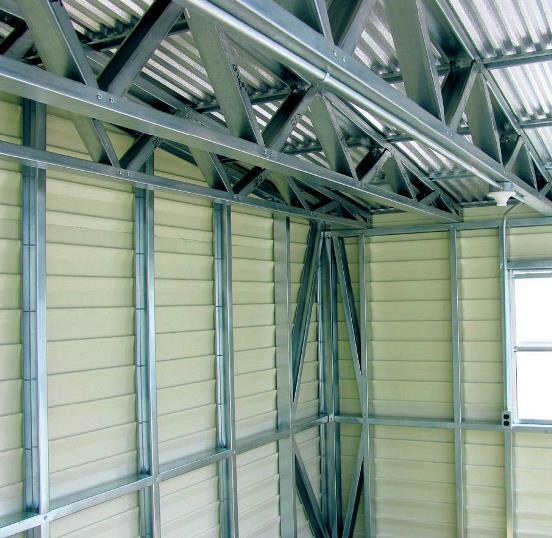 As with all of our wood frame buildings, you also get heavy gauge steel shear wall bracing along with hurricane clip connections on all wall studs, plates, and roof rafters. 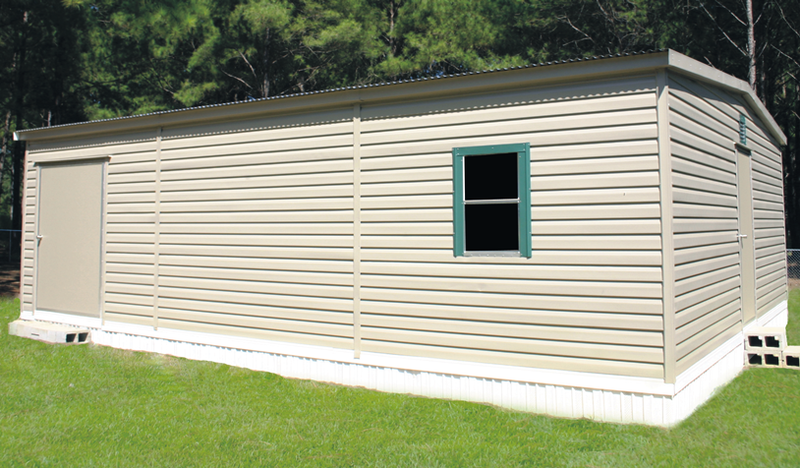 The Side-Gable Box Eave is also available in our Accu-Steel frame model. 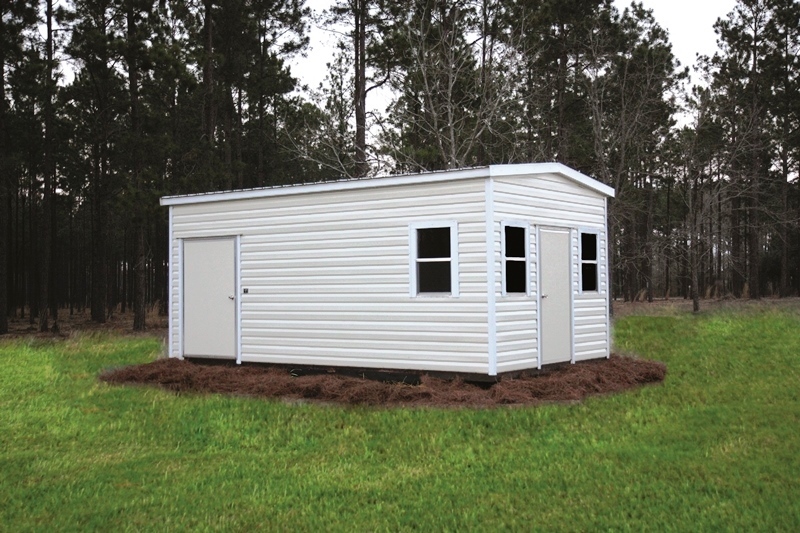 It comes with our impressive 18 gauge G-90 steel structure that is designed and engineered to be the strongest portable building available. 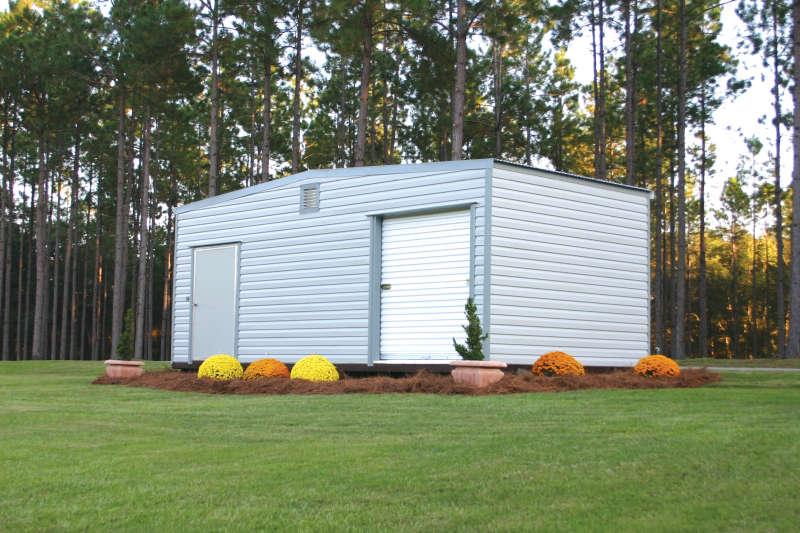 When you need a solution to your storage requirements, don’t just purchase a storage building to get by. Buy a Lark Side-Gable Box Eave and you will have the building that is the leader in good looks and durability. WOOD AND STEEL FRAME Just one look at the Lumberjack and you will see the unlimited storage opportunities that this unit provides. The massive eight foot high walls give you that super size room that you need for those oversize and awkward items that just won’t fit in your average storage building. Built to the same rigid standards as all of our buildings, the Lumberjack is designed and engineered to not only be big on storage, but to be big on uncompromising durability and product value. If you prefer, the Lumberjack is available in the Accu-Steel model. This unit comes with the same impressive features as our wood frame, plus the outstanding advantages that you get with a steel frame unit. We realize everyone does not need the outstanding and unique features that comes with the Lumberjack. However, if you agree that bigger is better, look no further. The Lumberjack is not only the building you need, but the building you deserve. The best just got better. 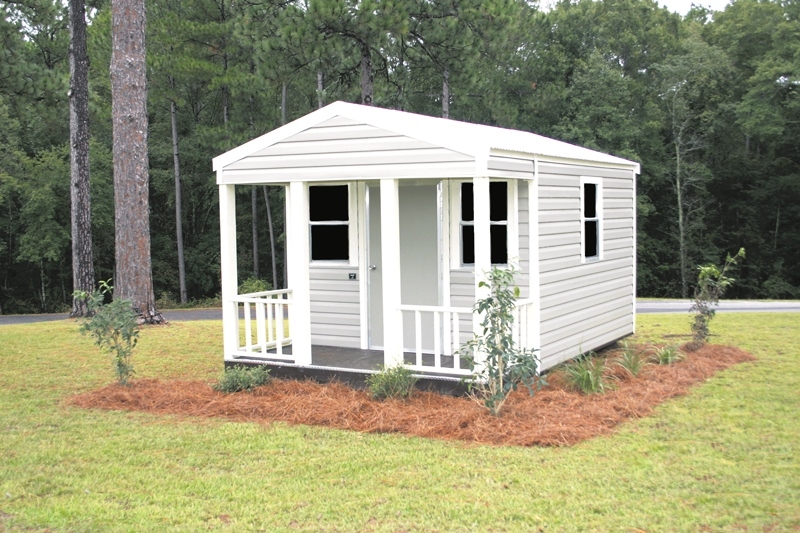 Whether you desire to rock your days away in the shade or you just want to stay dry accessing your storage building, our porch model has got you covered. We know that when you make an investment in a storage building you want it to compliment your property. By placing a porch on your building, you will enhance the appearance and give it a warm cabin feel. 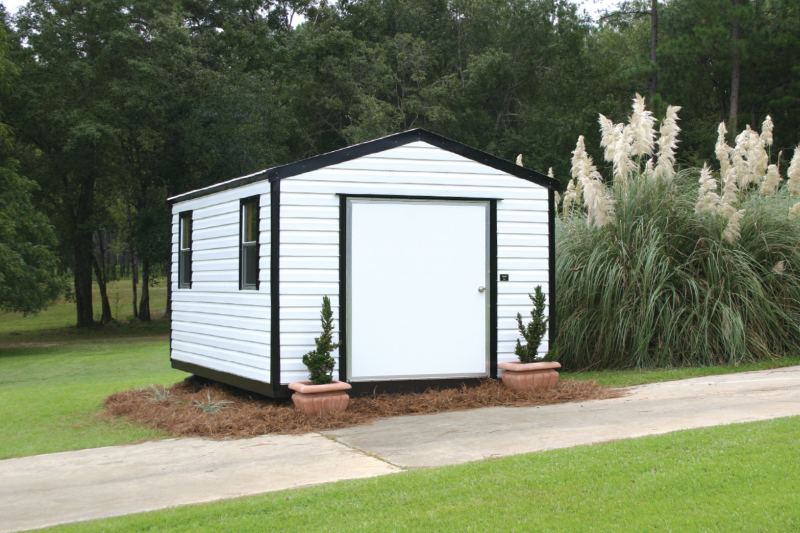 Whether you need an area to pot plants or a playhouse for the kids, this model can provide both. Our porch models can be much more than storage; they can be an object of relaxation and function. Our porch models are available in all the various models and sizes we offer, and the porches can be made in various sizes and configurations. The Eave Truss is our premier portable building for the customer with a big appetite for storage and the desire for a structure with superior strength and durability. 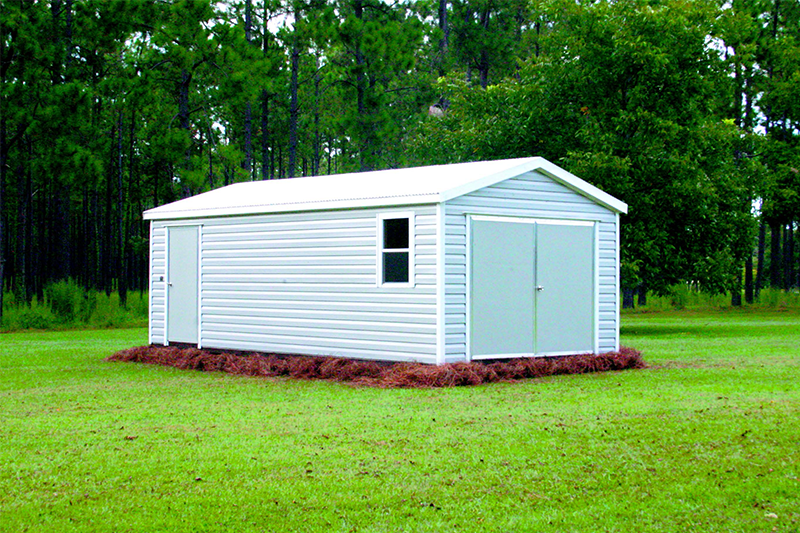 Sophisticated good looks and unlimited versatility make this building a natural for any storage requirements. 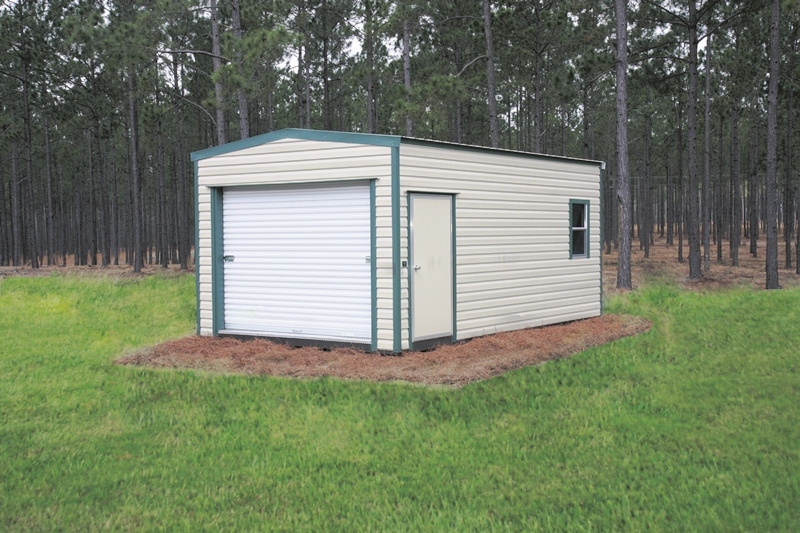 This unit comes with 8′ clearance on all walls, and attractive boxed eave, and a roof truss system that provides a continuous bottom cord the full width of the building. The Eave Truss comes standard with all these features, plus it has the ability in its regular configuration to accommodate a garage door or oversize doors without any modifications. The Eave Truss is available with either wood or steel frame and can be clad with aluminum or steel siding in a variety of profiles and colors. Functional, strong, durable, and cost effective are just a few words we hear when customers describe the Eave Truss. If you want a portable building that will satisfy the most demanding customer and exceed your expectations, make the wise choice. Purchase the Lark Eave Truss. It does not matter if you are a professional horticulturist or a hobby grower, the Lark Accu-Steel Greenhouse was designed and engineered with your growing needs in mind. We have the size and the options to meet all of your growing demands and requirements. 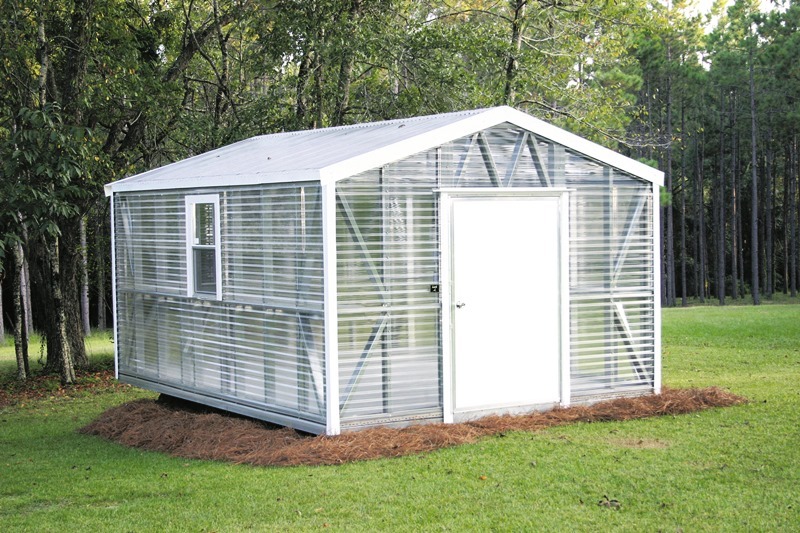 If productivity and efficiency are what you demand, the Lark Accu-Steel Greenhouse will deliver for you. The competitive cost and pleasing appearance of this greenhouse will make it a welcome addition to your backyard or commercial nursery. 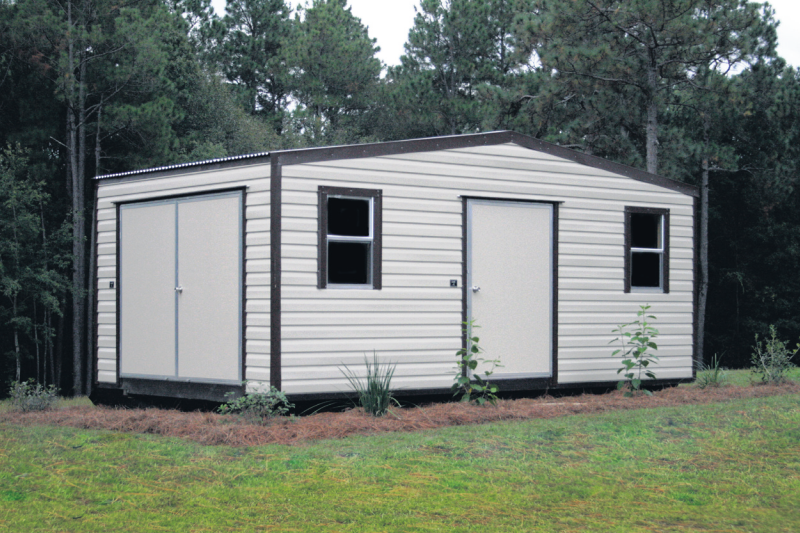 All walls and roof frames as well as the floor structure are manufactured using 18 gauge G-90 galvanized steel. On our Greenhouse floor structure, it comes standard without a floor, but we offer as an option a plastic composite floor that will give many years of maintenance free use. 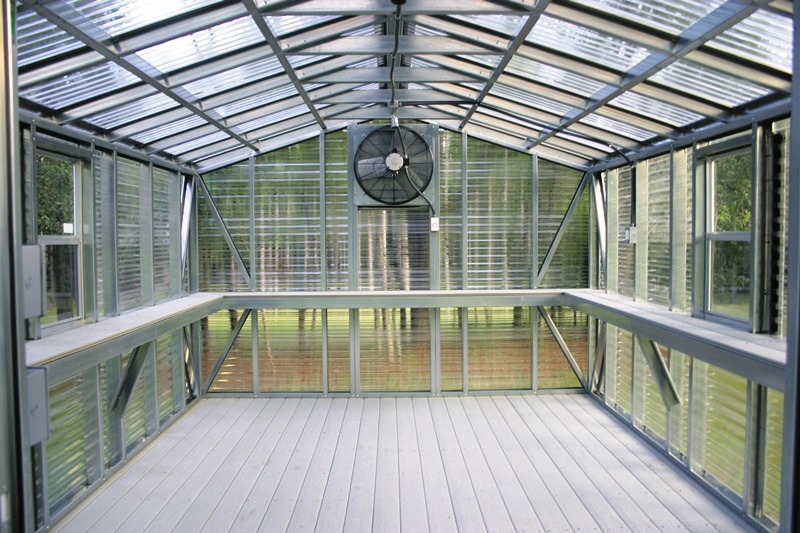 The exterior of the greenhouse is covered with professional grade fiberglass or poly-carbonate panels manufactured specifically for greenhouse use and performance. The Lark Accu-Steel Greenhouse is designed to give the quickest and most efficient growth to your plants and to promote fast rooting of cuttings and efficient germination of your seed beds. Our greenhouses can be built and configured with an assortment of options to meet virtually any growing need you may have. When you consider the purchase of a greenhouse, critically evaluate the competition, compare them all to Lark, and we are sure you will completely understand what we mean when we say “why not the best?